At Lakeside Daytona Dentist, we’re passionate about offering our patients a wide range of treatment options in order to ensure they get the most effective solution to meet their unique oral health care needs. 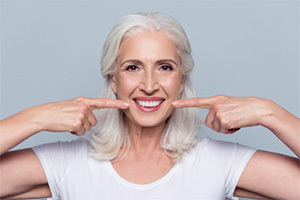 For those patients who have experienced advanced tooth loss, we offer removable dentures, traditional dental implant supported dentures, and innovative All-on-4 implant dentures. Before we recommend one of these treatments, our team will need to examine your smile and help you determine which treatment is right for you. All-on-4 has made it possible for more patients than ever before to receive a denture with the increased stability of support with dental implants. If you want to learn more about All-on-4 or any of our tooth replacement options, call our Daytona Beach dental office to schedule a consultation. Our skilled dentistry team members will examine your smile, review your treatment options, and help you to create an effective personalized treatment plan. 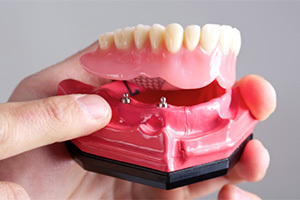 All-on-4 is an innovative implant denture method. It uses just four implants to support a denture, but rather than positioning the implants along the jaw line, the implants are placed to make the most of the naturally densest parts of the jawbone to support the whole denture. 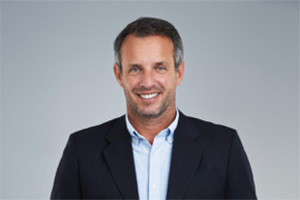 This allows patients who would otherwise need advanced preparatory tissue grafts to receive an implant supported tooth replacement with a more conservative treatment plan. What happens During All-on-4 Treatment? Like other multi-phase dental implant tooth replacement plans, an All-on-4 denture is placed over the course of several months. We begin by ensuring your oral health with preparatory tooth extractions and other dental services to improve overall oral health. Then, we will surgically place the implant posts. Two implants are placed vertically into the front of the jaw. Then, two implants are placed diagonally from the back of the denture to the front. Once your tissues have healed, you’ll return, so our team can design your final, custom denture. Once we receive the custom-crafted denture from our lab, you’ll return to the office where your prosthetic will be affixed. Once in place, All-on-4 dentures can last for two decades or longer before they need to be repaired or replaced. In order to extend the life of your All-on-4 denture, you’ll need to maintain proper hygiene at-home every day and visit our office twice a year for dental exams and teeth cleanings. You should brush teeth twice a day as usual, but to ensure the optimal results, we recommend brushing between meals to remove foods and prevent plaque buildup. 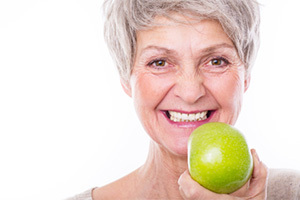 Even though your implant supported denture isn’t necessarily going to be damaged by plaque, you are still at risk for gum disease that can lead to implant failure, so you need to regularly brush your denture. You’ll also need to take precautions to prevent the accumulation of plaque between the denture and gums. We may recommend using antimicrobial mouth rinse or an air or water flosser to remove plaque around the denture.